Nonetheless, we had a marvelous ocean view room at the Whitewater Inn, and we had a wonderful dinner at the Sea Chest, where they take neither reservations nor credit cards, but where the food is superb. That short visit decided one thing for us: we know where we’re going for our vacation in October. One doesn’t have to have children to notice the passage of time. Terry and I got (back) together (having been friends in high school) in March 1991. Her sister’s son, Race, was born the previous September. I remember Race as an infant. I remember him as a youngster at Terry’s parents’ house at Thanksgiving. We had all had finished dinner and were watching Apollo 13. Race came dashing into the room as the capsule was approaching splashdown. He looked at the TV and said in amazement, “They’re gonna land in the water?” He had only known the shuttle. This month Race finished his junior year at Annapolis. We expect to see him graduate Memorial Day weekend next year. When my nephew Eric, my sister-in-law’s son (and my brother’s adopted son), got married, his wife’s daughter from a previous relationship was quite young. At the reception when they had the money dance, she thought that was a great idea and started running around to the guest tables with her purse open. My sister-in-law quickly scurried over to advise her that this was not proper behavior. That marriage long ago disintegrated, but the daughter has stayed with Eric. She graduates high school this month. Terry and I have done a few 5K walks together. I have to admit that I had never been properly prepared for any of them. So when we decided to do the AAUW Wildflower Run in April, which normally happens on Palm Sunday, so I can’t participate, but didn’t this year so I could, I was determined to be prepared. I made sure on my walks that at least three times I did a full 5K (3.1 miles) so I was prepared, and I was. I felt good about the Wildflower run when I had completed it. We were signed up for the Mushroom Mardi Gras 5K, Saturday of Memorial Day weekend, which we love because it’s a pleasant route along the Coyote Creek Trail. I had planned to do the same preparation, but a trade show in Las Vegas and our Southern California trip, combined with unseasonably hot weather between the two, meant that that did not happen. Given that, and given that Terry’s knee was in no shape to allow her to participate, I chose to skip it this year. Which is just as well, since my digestive system was in a cranky mood Friday afternoon and Saturday morning. Nonetheless, it’s good to know that I can comfortably do a 5K walk with proper preparation. When Terry and I were down in Southern California last week visiting my Dad and brother & sister-in-law, Bobbie, my sister-in-law, mentioned at breakfast that she and Brian were talking about visiting Ireland and Scotland in a few years. Terry and I have long talked about visiting Ireland, and I spontaneously, without consulting with Terry, told Bobbie to stay in touch with us as we might want to make the trip with them. I found out later that, fortunately, Terry was very much in agreement. At dinner Bobbie asked us if we were serious, and I said that while I didn’t think that I could stand to travel with my other sister-in-law, I really thought that I would enjoy travelling with this one. The other sister-in-law would be Terry’s sister, who can be very uptight and regimented. As Terry said in an imagined conversation, “No, Julie we’re not getting up to do that 7 a.m. tour.” Bobbie and Brian are much more relaxed in the way they travel. And Bobbie was quite pleased that we wanted to make the trip with them. I noticed the other day that a couple in the development behind us with whom we are slightly acquainted seem to be installing solar panels. That’s great. We’re delighted to have them as part of the family. 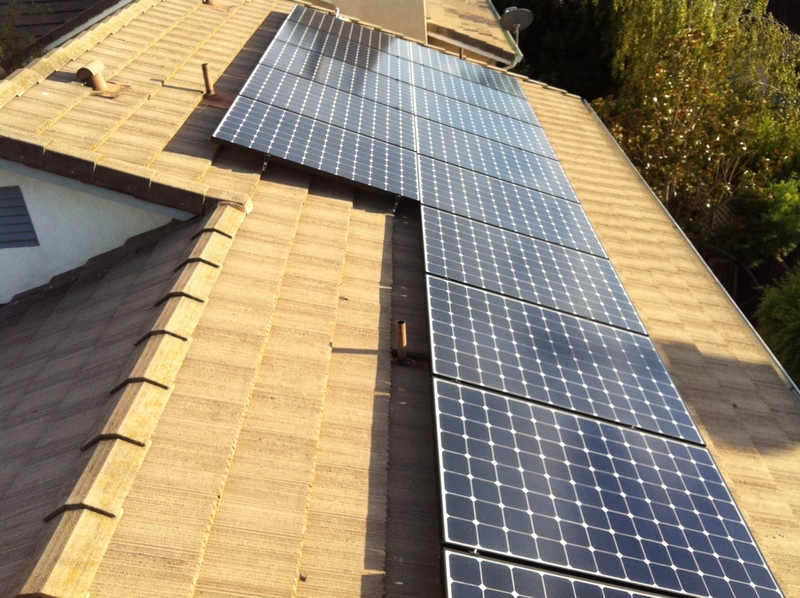 One of the motivations to install solar is to reduce one’s dependency on the electric utility. It was certainly one of ours. The irony, of course, is that solar panels tie you that much more closely to the power company. That’s because the electricity which you generate and don’t use you are selling back to the utility. That’s a good thing, of course. It’s very much an economic benefit to us. And we’re using a clean, renewable source of energy to supply power to the system. Working together, those of us in the neighborhood who have solar are, presumably, helping to reduce strain on the grid on hot days when electricity use spikes. So our while our relationship with the electric utility may not be what we envisioned when we first thought of getting solar, it’s nonetheless a positive, productive, mutually beneficial one.